There are four different archetypes in the game: Aggro, Mid-Range, Control and Combo. Aggro: the aggro deck’s goal is to do as much damage with numerous small minions. The goal of an aggro deck is to come hard and win fast, blowing out your opponent. Mid-Range: the mid-range deck tries to win the game through value minions in the mid game. It has survival tools in the early game and starts applying pressure by putting down larger and larger threats. The goal is to play control against aggro decks and as the beatdown player against control decks. Control: the control deck focuses on long games and aims to win the war of attrition. The goal of this deck is to delay the game, allowing you to execute stronger cards and combos than your opponent. Combo: the combo deck aims to win the game using a relatively small number of cards that instantly or very quickly win the game when combined (hence the name “combo”). Because of this win strategy, a common motif among combo decks is an emphasis on the ability to find specific cards quickly and win as fast as possible. Each one of these can have sub-archetypes and many times it is hard to categorize a certain deck and make it fall under one banner. Rush decks usually fall into the Aggro category, but they are slightly different from aggro decks. Unlike most aggro decks, they ignore trading completely and try to burn their opponents down by directly aiming at their face. Face Hunter is a typical Rush or Burn deck. Creature decks, are also known as swarm or minion decks. They clearly fall into the aggro category. The point of these decks is to fill the board with as many minions as possible, in as short amount of time as possible, and buff them to increase damage and health. Synergy is a large part of creating an effective creature deck. Unlike Rush decks, Creature decks make favorable trades and hit face when convenient or when close to lethal. Zoolock is a classic example of a Creature deck. Turtle decks are very similar in nature and purpose to control decks. If you enjoy slowly taunting your opponent, then the Turtle deck may be for you. Your chances of survival, and ultimately winning the game increase dramatically the longer the game continues. The Turtle deck is built around the concept of survivability and can generally withstand the damaging abilities and creatures that other deck types might throw at it. As the game moves into later rounds, and you have a higher mana pool, the deck allows you to bring out the big guns. An example of a Turtle deck is this Taunt Druid. Spells decks are hard to put into one fixed category. 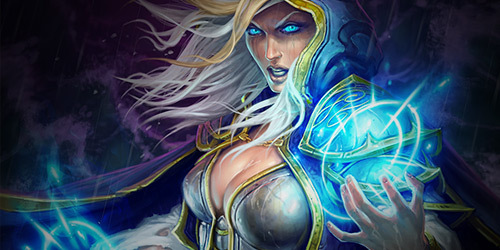 In Hearthstone history, the most popular spell-focused deck was Miracle Rogue – a Combo deck. The deck uses a huge array of spells, along with some minions, to hurt the enemy hero. The real advantage of this deck is that the spell damage can bypass Taunts and, if those spells are buffed by Malygos, it’s game over! Secrets decks might fall either in the Mid-Range, Control, or Combo category. Only three classes have secrets: Hunter, Mage, and Paladin. Some have made decks using every secret as the main source of control. This is especially effective for Mage, less so for Hunter, and least effective with Paladin. Nonetheless, given the right cards to support these builds, you can succeed. It’s a fun type of build; but you have to realize,when you use a secret, that you’re not in control of when that secret goes off. This means it’s not exactly control, but more of a consequence deck. Many players have made legend with secrets decks – Saturos, for example. Weapons decks make use of weapon damage efficiency. They usually equip powerful weapons and buff them up for maximum damage against the opponent. They likely fall into the Combo category, although they have some control and aggressive variations. The most recent Oil Rogue deck lists are perfect examples of weapons decks. Personally, I am a Mid-Range player. I like to have decent starts and decent drops throughout the game with no particular weakness, but no ridiculous combos either. On the right side of this article, you will find my current post-nerf Mid-Range Hunter deck list, with which I have been climbing the ladder since the start of Season 11. As you can see, this deck has a good mana curve, starting from turn 1 until turn 7, and it performs well against most decks out there. If you play several basic decks you can quickly figure out which play style you are most comfortable with, so that you can choose which archetype to focus on. Once it’s clear to you which kind of play style you want to adopt, you may proceed to the next step – choosing your hero. There are currently 9 different heroes in Hearthstone, and each one of them has a unique hero power. The hero power has a huge influence on the kind of decks you can build around a certain hero. For example, the Priest’s hero power clearly favors slow, control play rather than aggressive play. Because of this, most Priest deck lists are control lists rather than aggro lists. Similarly, most Hunter’s lists are aggressive, because Rexxar’s hero power favors that kind of play-style. From time to time, you see some aggressive Priests or control Hunters, but those decks aren’t usually consistent enough to see competitive play or large diffusion. This categorization does not mean that each hero performs best when following that particular play style. There are many players who have successfully brought their decks to legend playing an “unfavored” archetype with their hero. These include Deathrattle Priest, Aggro Warrior and Mech Shaman. Warlock is the exception to the rule, since Handlock has become a staple control deck in Hearthstone. Being able to successfully pilot a deck to legend is all about being comfortable with that particular archetype, that particular hero and that specific deck. Once you have picked the archetype and hero you are most comfortable with, it’s time to build a consistent deck. What does “consistent” mean exactly? It means that the deck can perform well against a wide array of opponents. If you want to know more about consistency in Hearthstone, be sure to check out our more advanced guides. While there are many advantages to building your own deck, net-decking consistent builds is a better first step. While a deck that you build yourself can be more familiar and easier to use, if you are not experienced, the deck consistency could be lacking. Many people think that it’s sad to copy/paste deck lists, but in order to learn, you have to start with something that you know works. So, don’t be afraid to browse through others’ deck lists and find the ones that suit you the most!